The #Beet150 competition offered the chance for two growers to travel to Chile, a country where the average sugar beet yield exceeds 100 t/ha and holds the world record for the highest yielding crop of 196.7 t/ha (adjusted). 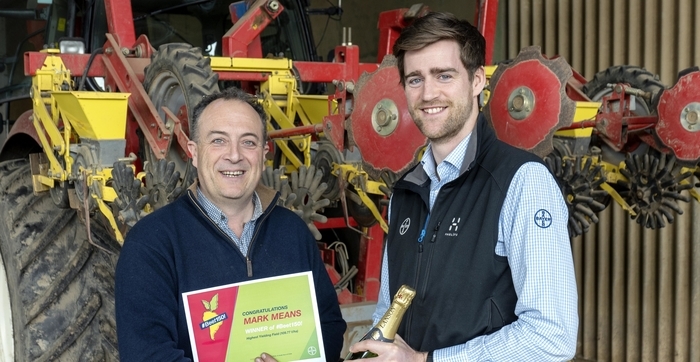 Mark Means won the competition for the highest yielding field lifted before 30th November 2018 with a yield of 109.77 t/ha. James Fretwell won the prize for the highest overall contract yield of 103.32 t/ha. Edward Hagues, Bayer campaign manager for root crops, congratulated the two growers on their performance describing it as truly remarkable given the difficult conditions that dominated during the 2018 season. Mr Means, who farms at Terrington St Clement, drilled the winning field of 32 hectares on 18th April after the ‘Beast from the East’ forced a one-month gap between the start and finish to sowing. In describing the conditions the crop faced during the season, Mr Means was keen to praise the contribution of his staff for helping to ensure the crop was able to perform strongly. “At roughly £1200/ha in fixed and variable costs, the crop needs to yield in the region of 100t/ha to make a respectable return but achieving this takes good management and the contribution of my staff deserves to be recognised. The land was ploughed well ahead of the winter and the drill operator showed great awareness by sowing deeper as the day progressed to ensure the seed was placed into moisture. We were roughly 1cm deeper at the end of the day than at the start,” explained Mr Means. James Fretwell who farms on the Isle of Axholme to the east of Doncaster also noted good land management as being central to a successful crop. “We only grow beet on our own land and that allows us to ensure good soil and nutrient management in the lead up to drilling. The late start to the season however, forced what was perhaps the biggest change to our crop management last season. The later drilling date meant a shortened window for the crop to reach full canopy ahead of the longest day, so we increased the seed rate to 1.23 units/ha. It was the right decision at the time though given that we had a plant population of 117,000/ha in early August we may have been overly cautious,” explained Mr Fretwell.